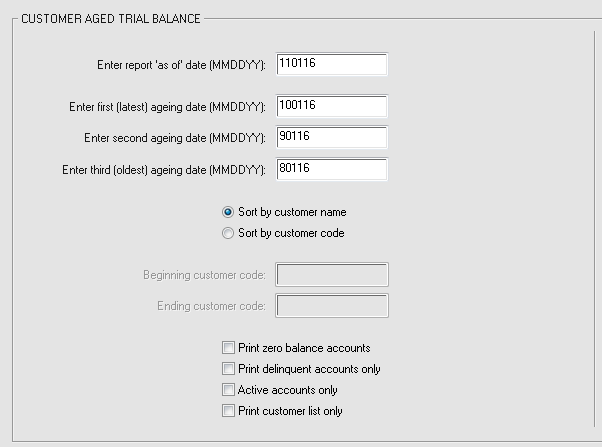 The Customer Aged Trial Balance will show you the balance due from your City Ledger (Direct Bill) customers. It also will show you the past-due ageing sums based on the dates you enter. For example you can print 30/60/90 days balances in addition to the current period. 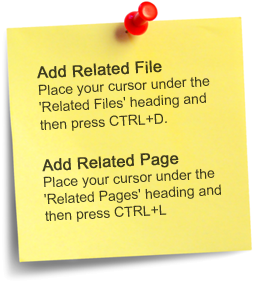 From the Direct Bill or City Ledger menu, select "Print Customer Aged Trial Balance. Enter the ageing dates and other information. The "as of" date determines the "current balance" sum. The three ageing dates determine the sums for those columns. You may print by customer name or by customer code. If you wish to print only one customer, select "sort by customer code". You will be prompted for the beginning and ending customer codes to include. See image below. Click the checkboxes to print zero balance accounts; print delinquent accounts only; print active accounts only; and/or print customer list only. Note that two of the accounts have a double-asterisk (**) to the right of the last column. This means that the account balance does not equal the sum of unpaid or partially paid invoices for Open Item account types. This does not happen often, but the most common cause is network or server interruption while an open item payment was being processed. Contact Execu/Tech Support for instructions on fixing out of balance accounts.